Women may have cultural permission to care way more about what’s in their skincare and (where it goes), but we’d like to take this opportunity to say that you, a modern man, are also allowed to care. Listen, we know this is a joke. But if we’re being fair, it’s not that far off from reality. We have cremes specifically for eyes, necks and hands, so the left elbow really doesn’t feel too far off. You’ve got a unique, special snowflake of a face too, and it deserves products formulated just for it! Maybe your skin is dry, or prone to acne, or sensitive or perpetually in a fight with your beard. If you want it to not be those things—face wash is ground zero in the fight. Your girlfriend and you might not have the same skin type, but stealing a cleanser from her medicine cabinet (and looking at some of the ingredients in it) will clue you in to what product might be great for your face. A primer on some of our go-tos based on skin type are below… in case you’re ready to stop living a life of crime and buy your own damn face wash.
Great if your skin is oily or slightly acne prone. Activated charcoal! Tea tree! Apple amino acid! This face wash is formulated with a whole buttload of natural ingredients to aid in clearing up acne and leaving skin with a more mattified appearance (aka it makes your skin look less shiny). Charcoal is like a skincare magnet that hoovers up the dirt and grime in your pores so it can be washed away, while tea tree helps tighten pores and keep the dirt from getting back in while you’re out in the world. Odacité Black Mint Cleanser, 3.38 fl. oz. Great if your skin is middle of the road, with no problems to speak of (lucky you). 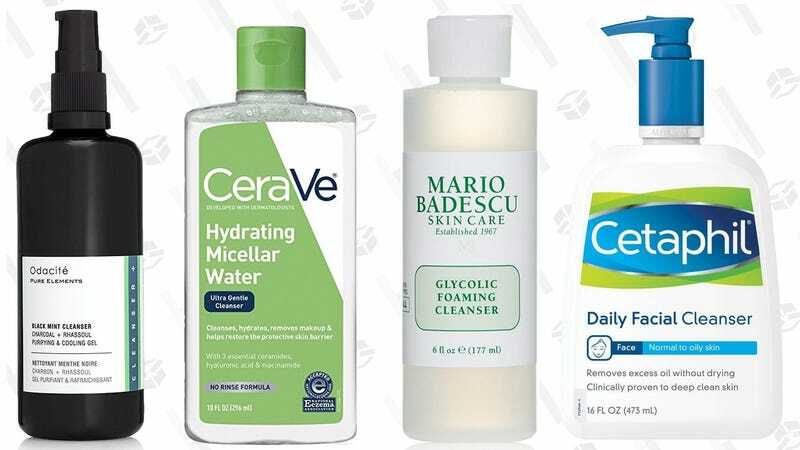 The chances are extremely high that your girl probably has a bottle of micellar water in her skincare arsenal. It’s extremely effective in taking off makeup, which you may or may not use (Hey, no judgement. If Chanel can launch men’s makeup, the world is your oyster, dude). And even if you don’t, your skin will like it because it’s formulated to literally trap and lift grime off your mug. To use, just dab a splash on a cotton pad and swipe it all over your face. No need to rinse, you’re set. Great if you skin is bearded, or you suffer from ingrown hair or razor burn. You guys, did you know that you don’t have to scrub your skin to exfoliate it? And in fact, too much of that harsh sloughing is really not good for your skin. Instead, ladies in the know (and now you, natch) use a wash with glycolic acid to brighten and retexturize skin. Dead skin cells block pores and hair follicles, so when they’re gone, facial hair is happy. Great if your skin is prone to redness, eczema, or flaking. Hey, sensitive is in these days. (Have you seen To All The Boys I’ve Loved Before? Your girlfriend has, and she has a crush on Peter Kavinsky so… Trust us on this.) The point being, if you’re a little sensitive on the outside, too, Cetaphil’s Gentle Cleanser is an affordable and easy go-to face wash. This might sound crazy, but it doesn’t have any soap in it, which can really dry out and irritate skin. The ingredients it does contain, though, are so gentle that you can use this wash without water if you want—massage a generous amount on your face, then gently wipe off excess with a washcloth. WTF Do I Wear On a Day Date?